As the author of what I call Dressage, Naturally, I am always trying to reconcile the bodies of knowledge that I have from the dressage world, and the natural horsemanship world. Long ago I realized that these definitions are not adequate and even hold people back from them enjoying their horse journey to the fullest. It is not something 'new' ... It cannot be something in isolation of the parts that contribute to it. Maybe it just means: "Dressage, of course"
... 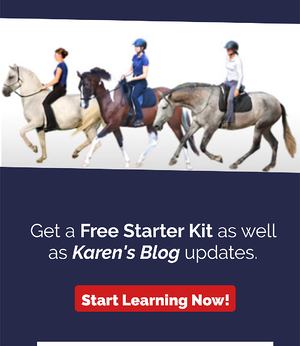 Since every dressage rider knows that all horses should move in the healthy way that the basics of dressage aspires to. But my experience in natural horsemanship definitely caused a shift in my perspective - a redefining of the priorities and context with in which I do dressage. Since horses are my life, this new perspective on horses is intimately connected to my perspective on life and vice versa. I used to consider myself a dressage trainer. I did dressage. Through doing dressage I learned techniques that communicated to my horse about things that would create harmony and lead to happiness. I would draw a big block illustrating Dressage on the bottom, and the pinnacle ... The final goal would be happiness. This I drew as a small block resting at the top. My reality was that I did a LOT of dressage ... And the dream was that someday, sometime ... After finally mastering the perfect half halt at just the right time, I would get it right and I would be happy. That's a lot of time doing dressage, and just a little time being happy. I am happy. Because I am happy it is easier to be in harmony with my horse. When in harmony I am able to communicate with him about some techniquesthat lead to dressage. The big block on the bottom is 'happy'. I do my best to spend most of my time feeling happy; happy with myself, happy with my horses and creating horses that I dream feel happy also. Relatively little time is doing dressage. Now, that doesn't mean I don't still strive and achieve in dressage. I can do all the dressage I need for a particular horse in just 45 minutes, 3-5 times a week. So this training scale - or what ever you want to call - it is my reminder to myself of my priorities with my horses. It also illustrates what I hope my horse's lives are like. I hope they are happy. I hope that only a fraction of their experience with me is doing dressage. I hope that they experience more time feeling in harmony with me than they do worrying whether their shoulder-ins are engaged enough. In my mind, it is not the difference between 'normal' and 'natural', because I have met very happy dressage riders and I have met very grumpy natural horsemen. Dressage can cause you to be super narrow focused ... And natural horsemanship can cause you to forget to build something on top of your foundation. So this is my personal reminder to keep things in balance. I am not a 'dressage rider' the same way no horse was born a 'dressage horse'. We are beings that are doing our best to coexist in this crazy world and maybe accomplish some pretty great stuff while we are here. Maybe this can help some other people. too ... And besides, if you start with happiness and harmony you'll be having a great time whether or not you ever find that perfect half halt.